I have missed my blog and all my blogosphere friends these past couple of months, I hope to get back in the groove soon but only time will tell. Losing Stripe-Stripe was rough and today my darling cat, Agent Orange, has turned up missing. And he never misses breakfast. Never. Life in the country is rough and time seems to be passing faster and falling shorter day-by-day. Plus I am getting fat. But that is another story. Today I’d like to share a collection of things Addie gathered on walk in Kentucky we took while visiting friends last weekend. It began with the white flower in the center. 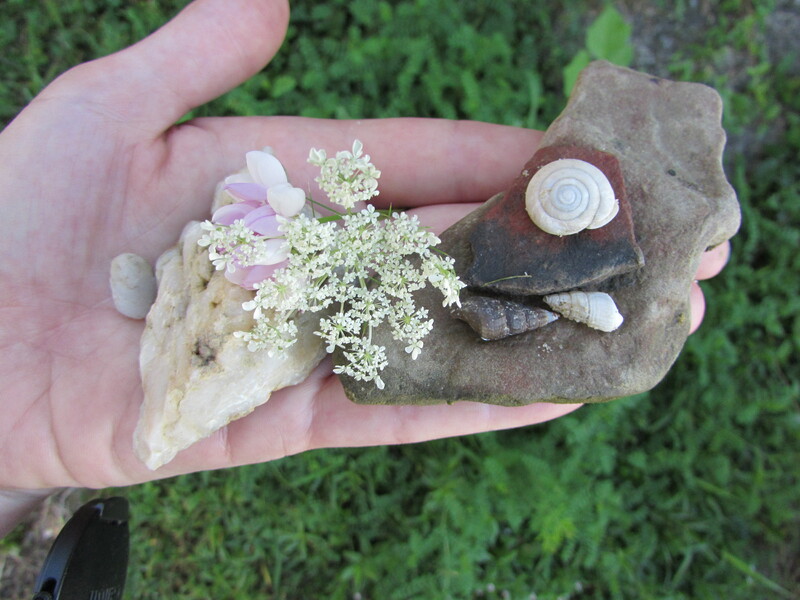 Then grew to include 2 more flowers, a snail shell, 2 spiral shells, a hoof shaped rock, a painted sky colored rock and just some pretties in general. When and if you are having a bad day, take a child for a walk. They have a way of discovering things unseen and restoring emotions long lost. I hope you all have a lovely Monday. And go for a walk, with a child if possible. Looking at anything with a child gives such a different outlook. Forget the 7 wonders of the world – they’ll be more transfixed by the bug that’s crawling up the wall. And so it should be. 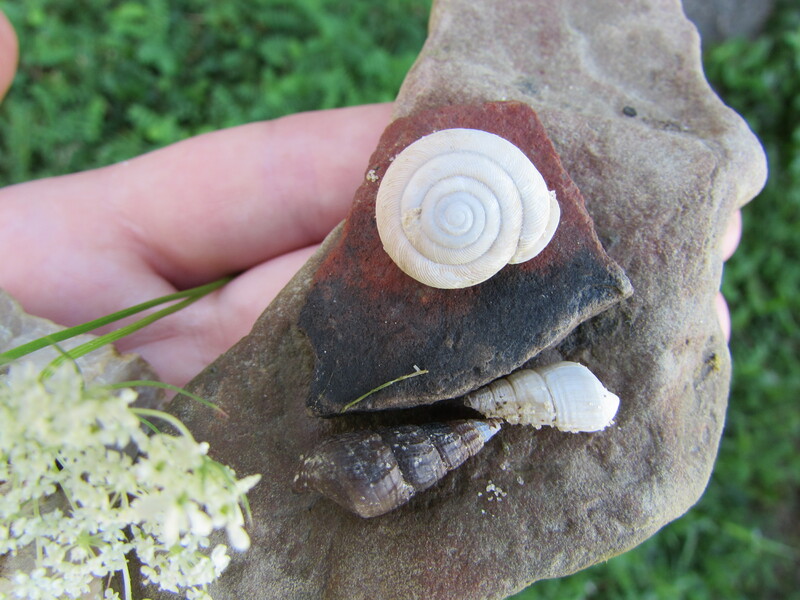 Pretty snail shell. Hope Agent Orange turns up. Thank you for your posts! Keep your chin up and may God’s peace surround you! I don’t have any little children on a daily basis but it is so much fun when they do come to visit to hear and see their perspective on life! Little Addie sure puts a smile on my face at the things she comes up with! Hope the cat comes home! Our youngest daughter had one to leave for 3 months one time! Oh how I wish I could go for a walk with a little one. Safe return for you kitty .. Thinking of you ..